During London Fashion Week in February, it seemed like every editor and street style star who was wearing jeans had a dress over the top. 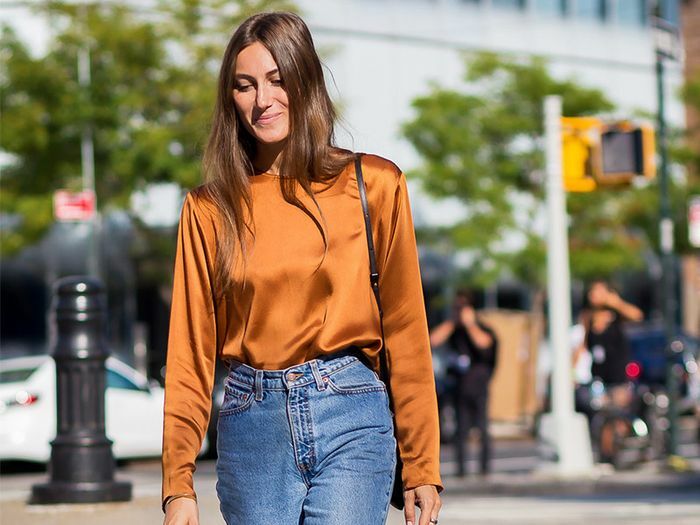 This might sound like a dangerously '00s styling move to pull off outside of the fashion week bubble, but if you follow a few simple rules, it can be the most interesting way to invigorate your most relied-upon denim in 2017. The number one guideline when wearing a dress with jeans is to make sure that the hemline is slightly cropped and skimming the ankle. As for the cut, straight-leg jeans work best, with either raw edges or rolled-up hems sealing the deal. Bulky hemlines and heavyweight denim will only be harder to streamline when layering, while super-skinny silhouettes don't quite look casual enough. You also want your dress to have movement and be even more featherlight so it seamlessly blends with your jeans. We have seen a number of tricks you can use to achieve the look even if you think a certain frock wouldn't work, like wearing a shirt dress, which you can allow to billow open, or selecting a see-through tulle dress that flashes plenty of denim underneath. Scroll through the gallery below to see our five favourite ways to wear a dress over jeans. 1. Look for a dress with a dramatic slit. Style Notes: Net-a-Porter's Lisa Aiken shows that a dress with an extreme slit layers perfectly over a pair of jeans, as it reveals the entire stretch of denim, elongating her silhouette. Her winning combo? A high-neck fuchsia dress by Balenciaga over straight-leg blue jeans. 2. Jeans make your evening pieces daytime-appropriate. Style Notes: Harper's Bazaar's Anna Vitiello shows that when wearing a dress over jeans, you can experiment with unlikely layering. She wore a racy red slip dress with a dramatic thigh-high slit over a pink Rejina Pyo blouse and jeans with rolled-up cuffs. Proof that relaxed jeans can make your evening dresses daytime-appropriate. 3. Wear a shirtdress half-unbuttoned. Style Notes: One of the best dress styles for this layering is a shirtdress, especially if you unbutton it from the waistband of your jeans, as seen on fashion consultant Kate Foley. 4. For a smarter look, opt for dark denim. Style Notes: If you want to try the trend but in the subtlest way possible, follow Pandora Sykes's lead, and opt for a pair of black jeans. They look much smarter, and they will doubtless remind you of what you've probably been wearing all winter long: tights. 5. Sheer, floaty dresses always look amazing with jeans. Style Notes: If you've been to Zara recently, you'll notice that embroidered mesh dresses are having a moment. Rather than going risqué, they look especially cool when toughened up with a pair of blue jeans and ankle boots. For more tips on how to wear jeans now, see our guide to the key denim trends for 2017.